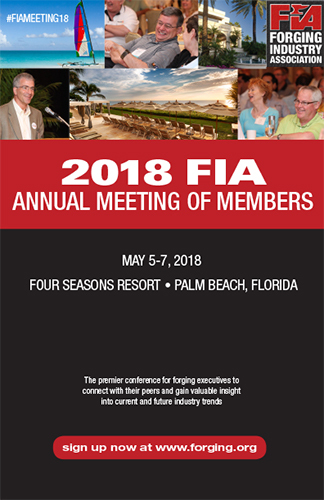 The 2018 FIA Annual Meeting of Members was a huge success! More than 150 forging executives and their guests gathered together at the Four Seasons Resort in Palm Beach, Florida, for three days of interactive learning, inspiring stories and networking with friends and colleagues. This year’s conference featured presentations from industry experts and motivational speakers that included an informative (and entertaining) economic update from Dr. Christopher Kuehl, a strategic planning session with Glenn Tecker, a Washington update from Jack Levy, and leadership training with Shawn Ishler. Jeremy Bout gave a motivational presentation on using the power of storytelling through video to attract the next generation of manufacturers. The business program closed with a very powerful and inspiring message from Rev. Gregory Boyle, founder and director of Homeboy Industries and author of the New York Times bestseller Tattoos on the Heart: The Power of Boundless Compassion. The association also welcomed incoming Chairman Willard T. Walker, Jr. of Walker Forge. Willard will serve as FIA chairman for the 2018-2019 fiscal year. The association thanked outgoing Chairman Jeffrey T. Jones of Forge Resources Group for his dedication and service over the last year. The meeting offered a wide variety of networking activities. Guests participated in an Everglades air boat tour, a historic Lake Worth walking tour, stand-up paddle boarding and other water sports. The annual golf tournament was dampened by a little rain, but that didn’t keep the golfers off the Lake Worth Golf Course for some friendly competition. Evening receptions and a closing banquet complete with a four-course dinner and dancing concluded the event. A great time was had by all who attended the 2018 FIA Annual Meeting of Members. The Forging Industry Association staff would like to thank everyone who made this event possible, especially the following event sponsors: Electralloy, Ellwood Quality Steels Co., FRISA Steel, Specialty Ring Products, Weber Metals, Finkl Steel, Nucor, Gerdau, Eaton Steel and Timken Steel. Thank you for your continued support and investment in the association. Be sure to mark your calendars for the upcoming FIA Fall Meeting of Members taking place from October 15-17, 2018, at the Worthington Renaissance in Ft. Worth, Texas. We hope to see you there! Bill Hoban – President, Green Bay Drop Forge Div.